I could almost consider this a two-year project because the book was originally my doctoral dissertation, which I began writing in 2011 and defended in 2012. It took me another year to actually do the book adaptation, which was a different beast entirely. If I wanted to reach across to students, which included my youngest brother (who’s in high school), I realized that I had to re-write the entire manuscript. It had to be relate-able to those who are not academics and those who love playing games but are not familiar with game development jargon. From 347 pages, I reduced it to 223. I also had the help of editor Maite Salazar, whom I have known way before her brother married my cousin (haha), and is a writer I greatly admire. Maite has an MFA in Creative Writing, which was just the discipline I needed as support, because she helped me organize the stories I wanted to tell. This book is specifically about Filipino women social gamers who have played Gardens of Time, The Sims Social (may it rest in peace), and Cityville. I realize that — after the two years I spent writing about these women — these games may seem outdated. The women gamers’ stories, however, are still fascinating for me. I believe it can pave the way for future studies on what motivates Filipino women gamers. 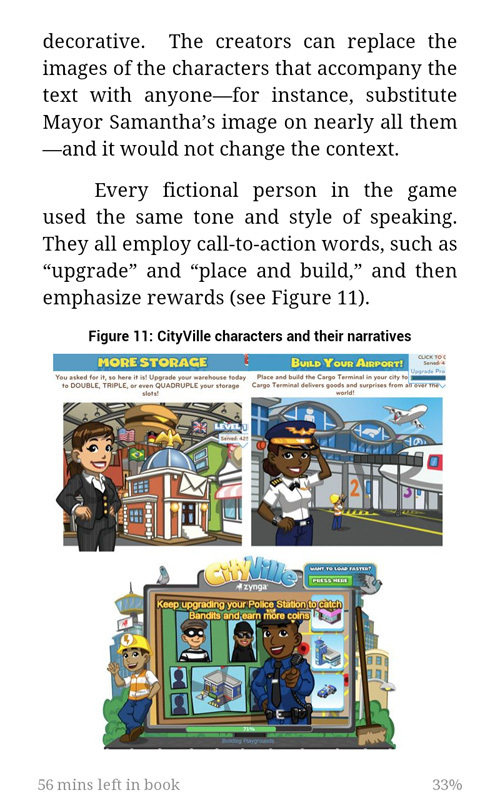 Here’s a sample from the Kindle edition, which is my favorite version since it’s in full color (and the least expensive). I usually set my Kindle to display huge texts so as not to strain my eyes. 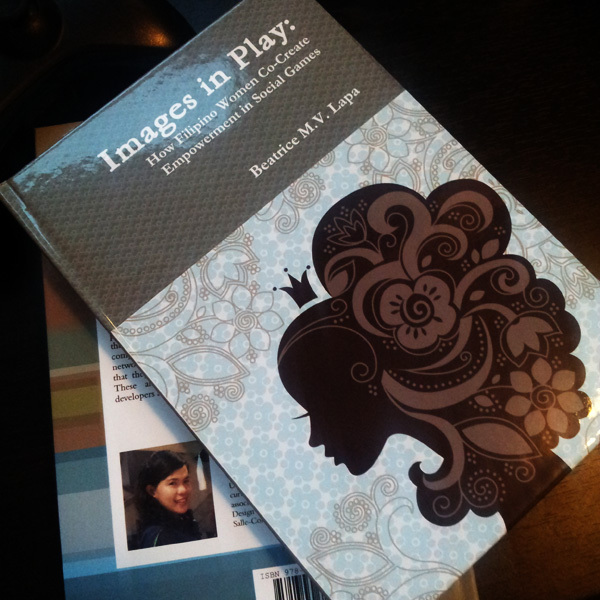 Images in Play is available in hardcover, paperback, and Kindle editions. If you have bought the paperback edition from Amazon.com, you can get the Kindle edition for FREE. NOTE: As of the moment, only the paperback and Kindle editions are available at Amazon. It will take about a few weeks for the hardcover to be available in Amazon, though it is currently available in the link I indicated above. NOTE 2: For students who plan on using the book as reference, this is no longer considered a dissertation because its format is completely different. 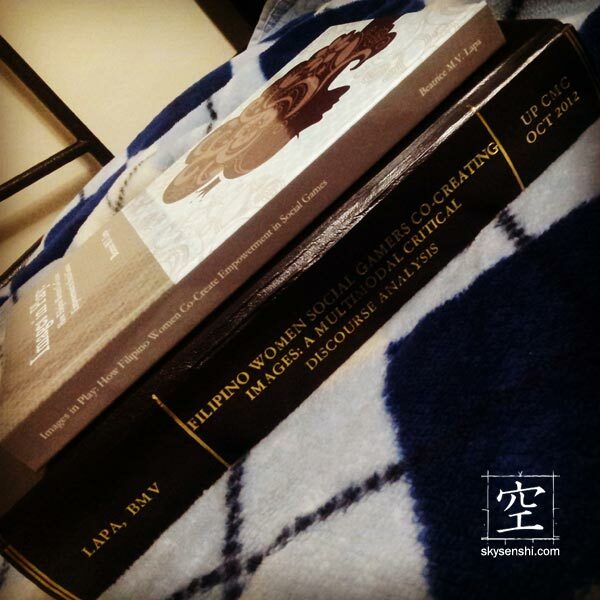 If you want access to the unpublished doctoral dissertation, however, I believe the University of the Philippines submitted it to the National Library. This entry was posted by skysenshi on January 12, 2014 at 2:47 am, and is filed under Favorite Projects, Published in Print. Follow any responses to this post through RSS 2.0.You can leave a response or trackback from your own site.